Not my favorite figure, but still neat. Very complex, fun transformation, cool weapons (though my swords get hung up a lot). Nice an posable, but could have easily included a blaster or something as an additional weapon. They changed enough to make this a new mold. 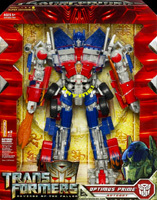 A lot more complicated transformation than the 2007 movie Leader Class Optimus Prime. I like the double swords & how they fold away. WAY BETTER than Leader Class Megatron. Overall, a great Optimus Prime. I just found this and Megatron at a Super Target and I didn't know they would be out yet. I am already glad they didn't use the same mold as before. Two swords, very nice. The 1 phrase is getting old already.